Internet marketing, also referred to as online marketing, is the practice of promoting a business or brand via the various wireless media resources provided by the Internet. Social media marketing – This, as the name implies, refers to the practice of using various social media platforms to raise interest in and awareness of a business, brand and/or product. With social media marketing, a company generally sets up and populates social media accounts on the most widely platforms, including (but not limited to) Facebook, Google+, LinkedIn, Twitter and Pinterest.In general, social media marketing is an extremely cost-effective way to reach out to potential new customers or clients, as most social media platforms allow companies to set up new accounts for free (and/or pay a minimal cost for more extensive services or reach). One of the key components to making social media marketing effective, however, is a continued effort, which specifically means regularly posting (e.g., posting daily) interesting blurbs, photos, videos, etc. to each account. Search engine optimization and marketing – This avenue of Internet marketing involves tailoring marketing efforts towards search engine spiders in order to rank higher or appear in certain searches. While search engine optimization is the practice of strategically developing content (e.g., blogs, videos, infographics, etc.) with certain keywords, links, etc. in order to rank higher in search engines when specific terms or phrases are searched, search engine marketing refers to the practice of buying ads based on certain words or phrases (and these ads will then appear when users conduct searches based on the paid-for ads and phrases). 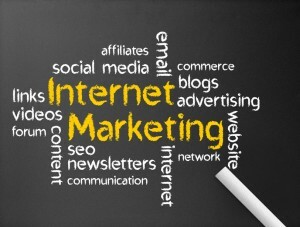 Look for our upcoming second part of this blog for a further discussion on some of the specific approaches used in Internet marketing. The elements explained in the two parts of this blog can be used to create effective online marketing strategies for various types of businesses and brands.